Some of the most mysterious cosmic residents have just become even more puzzling. New observations of globular clusters in a small galaxy show they are very similar to those found in the Milky Way, and so must have formed in a similar way. These new findings don't fit, however, with the leading theories that have been developed to explain how globular clusters form. "Our observations show that it is still a mystery how globular clusters formed," said Jean Brodie, professor of astronomy and astrophysics at UC Santa Cruz. Brodie is a coauthor of a paper on the new findings published November 20 in the Astrophysical Journal. First author Søren Larsen of Radboud University in Nijmegen, the Netherlands, was formerly a postdoctoral researcher in Brodie's group at UC Santa Cruz. The astronomers used the Hubble Space Telescope's Wide Field Camera 3 (WFC3) to observe four globular clusters in a nearby galaxy known as the Fornax Dwarf Spheroidal galaxy, a small satellite galaxy orbiting the Milky Way. Globular clusters are large balls of stars that orbit the centers of galaxies, but can lie very far from them, and they remain one of the biggest cosmic mysteries. They were once thought to consist of a single population of stars that all formed together. 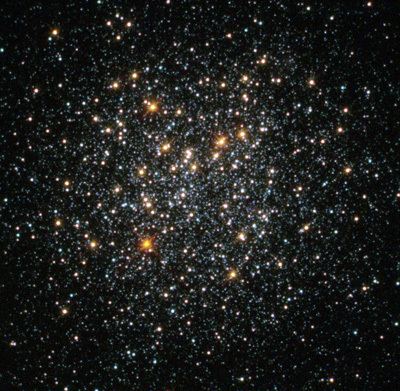 However, research has shown that many of the Milky Way's globular clusters have complex formation histories and are made up of at least two distinct populations of stars. Of these populations, around half the stars are a single generation of normal stars thought to have formed first, followed by a second generation of stars that are enriched with different chemical elements. In particular, the enriched stars contain up to 50 to 100 times more nitrogen than the first generation of stars. The proportion of nitrogen-rich stars found in the Milky Way's globular clusters is much higher than astronomers expected, suggesting that a large chunk of the first-generation star population is missing. A leading explanation for this is that the clusters once contained many more stars, but a large fraction of the first-generation stars were ejected from the cluster at some time in its past. This explanation makes sense for globular clusters in the Milky Way, where the ejected stars could easily hide among the many similar, old stars in our galaxy's vast halo. But the new observations, which look at this type of cluster in a much smaller galaxy, call this theory into question. "Many of the usual theories that have been developed in order to explain the apparently complex formation of globular clusters require them to have been far more massive initially than they are now," Brodie explained. "In the Milky Way, the stars lost from the clusters might have become part of the halo of our galaxy, but in the dwarf galaxies (such as Fornax), the stars that are supposed to have been lost from the clusters are nowhere to be seen." The astronomers' detailed observations of the four Fornax clusters show that they contain a second generation of stars and indicate that they formed in a similar way to one another and to clusters in the Milky Way. 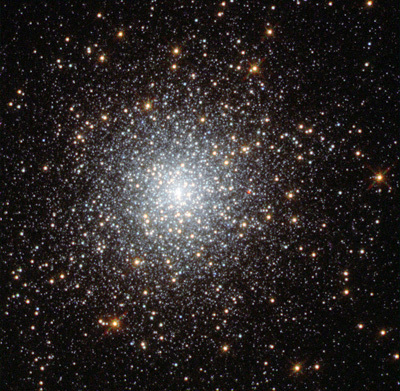 "These globular clusters are far from being the simple stellar populations people used to assume," Brodie said. Specifically, the astronomers used the Hubble observations to measure the amount of nitrogen in the cluster stars, and found that about half of the stars in each cluster are enriched at the same level that is seen in the Milky Way's globular clusters. This high proportion of second-generation stars means that the Fornax globular clusters' formation should be covered by the same theories proposed to explain globular clusters in the Milky Way. Based on the number of nitrogen-rich stars in these clusters, they would have to have been up to ten times more massive in the past before kicking out huge numbers of their first-generation stars. But, unlike the Milky Way, Fornax doesn't have enough old stars to account for the huge number that would have been banished from the clusters. "If these kicked-out stars were there, we would see them—but we don't," said coauthor Frank Grundahl of Aarhus University in Denmark. "Our leading formation theory just can't be right. There's nowhere that Fornax could have hidden these ejected stars, so it appears that the clusters couldn't have been so much larger in the past." This finding means that a leading theory on how these mixed-generation globular clusters formed cannot be correct and astronomers will have to reconsider how these mysterious objects, in the Milky Way and further afield, came to exist.